Bangladesh Police Station phone number – Police Station enquiry numbers are across the country. 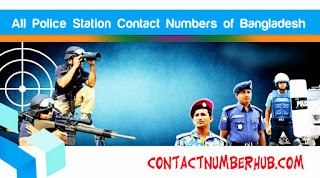 The main aims of the Bangladesh Police is to provide the best services through dedication, efficiency and competence along with respecting to the citizens of Bangladesh to make the country safer and better place to live. The police force is firmly determined to maintain social order, enforce law, enhance public safety, decrease crime and ensure the internal security supporting the community actively.